The new Friendship Hospital for Animals website is up and running with all kinds of exciting features. One especially cool new service is our online pharmacy. (Guess what -- our prices are LOWER on every medication than those of the discount pet pharmacies advertised on TV!) You can also order your prescription diets from Hill's, Royal Canin, Iams and Purina online. You can show off your Friendship spirit with Friendship Gear and buy fabulous pet accessories from FetchDog, with proceeds going to the Humane Education Fund sponsored by the Washington Humane Society and Washington Animal Rescue League. 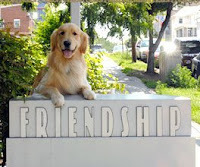 There are links to this awesome blog, of course, and also to Pet Portals (free private pet health websites for all Friendship clients). And there's also plenty of basic information about the hospital, our doctors and other team members, policies, and the services we offer. The website is yet another example of how we are working to provide you the best care for your pet.